Young Adult Trivia - The trivia game night for Saturday has been CANCELLED due to impending weather. The next meeting will be Friday, January 15. Stay tuned for more details. 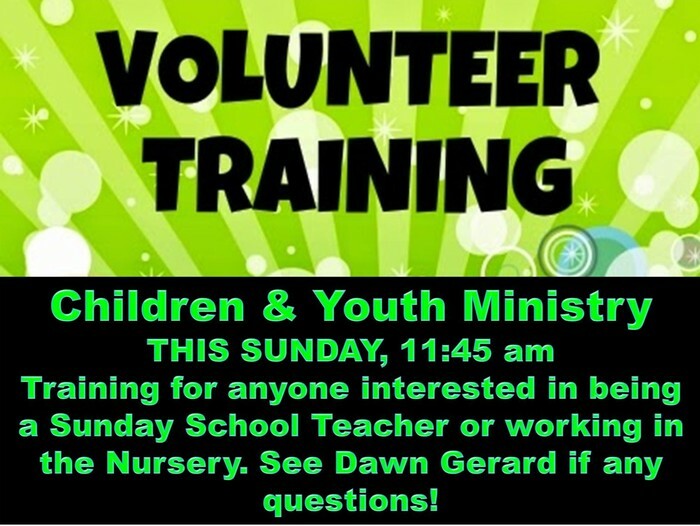 Volunteer Training (Children & Youth Ministry) - THIS SUNDAY, January 10, 11:45 am. This training is for anyone interested in being a Sunday School Teacher or working in the Church Nursery. See Dawn if any questions! 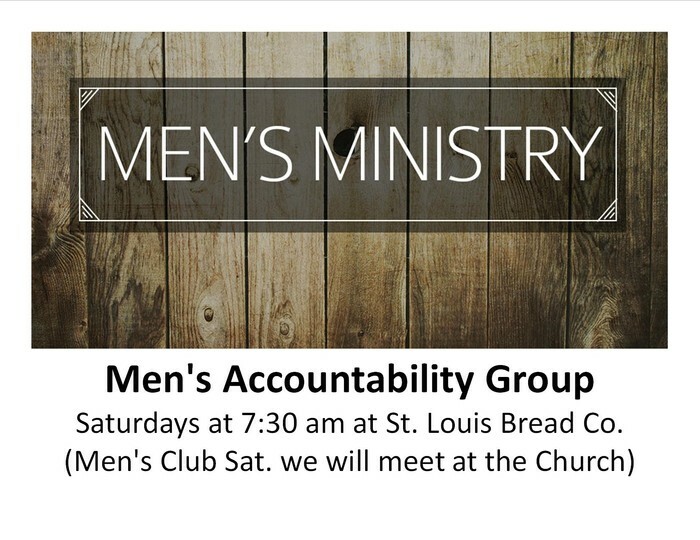 Men's Accountability Group - Saturdays at 7:30 am, at St. Louis Bread Co. in O'Fallon (except Men's Club Sat. we will meet at the Church). 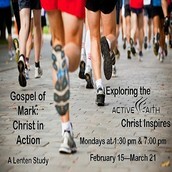 This small group will focus on the day to day recognition of how God works in our lives. This promises to be an exciting dynamic group where friendships are strengthened, forged and where you are supported. We are beginning to build a New Outreach Ministry that would support people in our church and community whose spouses have died. Come join us Sunday afternoon, January 17th, at 4 pm. Bring your ideas to share and let's get started. 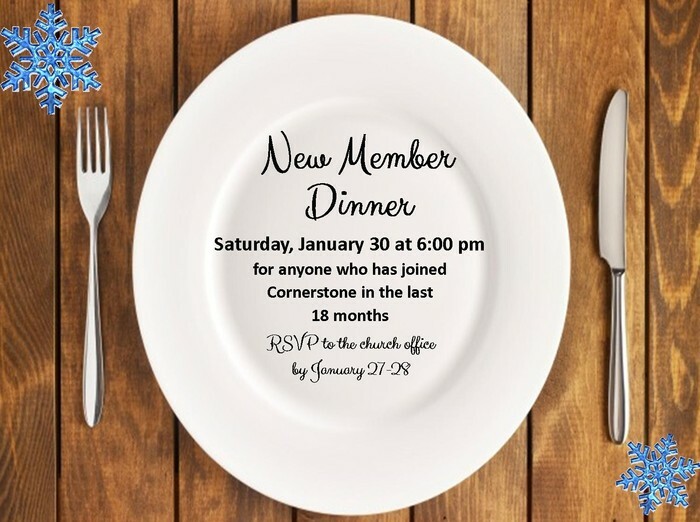 New Member Dinner - Saturday, January 30, at 6 pm for anyone who has joined the church in the last 18 months. Please RSVP to the office by January 27-28. Monthly Newsletter - The Monthly Newsletter has been transitioned to an email version, which will save on postage and printing costs. We will still have a limited amount of print versions available in the brochure rack in the Lobby (top pocket on the right) and will send the print version to our homebound. If you haven't already signed up to receive the Monthly Newsletter by email, and would like to be added to our email list, please sign-up on the green insert available in the bulletin, OR email Stacy at stacymcglasson@umcornerstone.org. 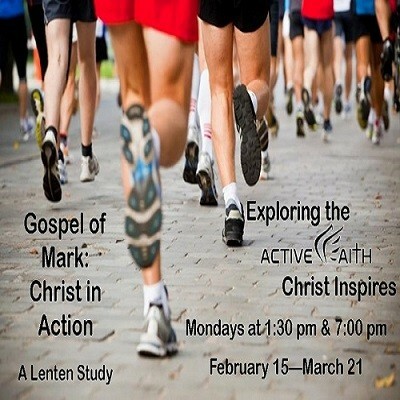 Join us online through our social media sites or follow along in the monthly newsletter and read the whole Bible in a year. There will be daily postings on the sites and monthly postings in the newsletter. We hope that you will join us in this endeavor. Please pick up your 2016 offering envelopes on the table in the Lobby. 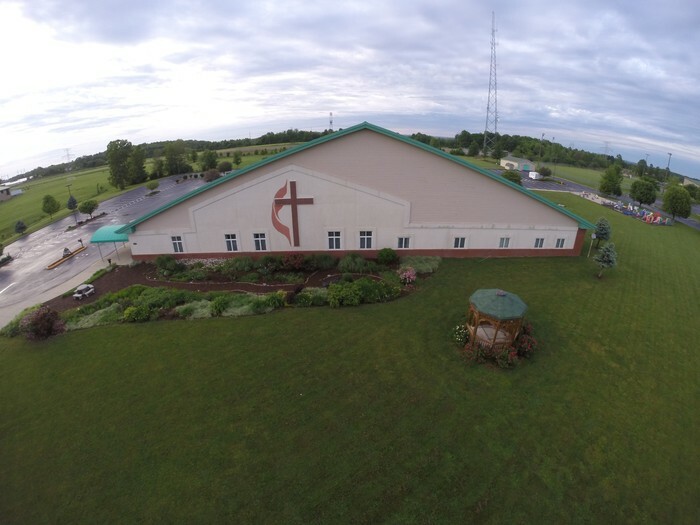 If you don’t have assigned envelopes and would like them, please leave a note for Stacy in the office or email stacymcglasson@umcornerstone.org. Food Pantry Needs - Jelly (no glass, pls. ), & boxes of cold cereal. Non-Smoking Campus - The Executive Team has voted to make Cornerstone a non-smoking campus, beginning in February 2016. More information to follow. Community Life...For more information on any of today's announcements or upcoming events - visit our website: www.umcornerstone.org. Or call us at 636-379-5334. Reminder to Committee Leaders & Small Group Leaders: Please make sure your meetings & events for the year have been communicated to the office. Click on the link below the weekly calendar to view the Monthly calendar on our website. For any changes or additions, please contact Stacy in the office at stacymcglasson@umcornerstone.org.